Jonathan Ward’s outfit ICON 4X4 takes ratty old Land Cruisers and completely retools them. We’re talking scratch-built frames, huge supercharged V8s, and painstaking attention to detail with stratospheric price-tags to match. We figured nobody could bare to beat up on a vehicle like that. We figured wrong. You might have already heard about Ward and his projects; the attention to minutiae, the overbuilt-everything approach. Well, all of the trucks you’ve seen him build were for customers with specific requests. This is the ICON FJ44 Petersen Special, and it’s Ward’s personal dream of the very best thing a Toyota FJ40 can be. It began life as, well, does that even matter any more? 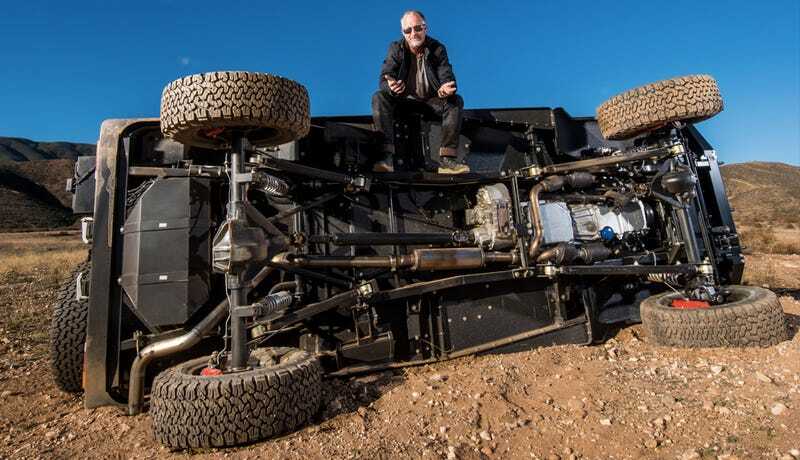 Ward and his team took the spirit of the iconic “shorty forty” Toyota Land Cruiser and re-executed everything on it to extreme levels of precision and quality. The rest of the interior got a similar treatment, but Ward wanted to call special attention to the buttons labeled with a “funky new font he likes” and a cool 4x4 instructional plaque made specifically for ICON by an aerospace company. Those sun visors are off a Learjet. The body was blasted and fitted to a completely custom chassis. All plastic bits have been banished in favor of powder-coated metal and laser-cut aluminum. A supercharged 6.2 liter GM V8 was stuffed under the hood, which puts an “estimated” 500-plus horsepower to all four wheels through heavy-duty Dana axles. Locking differentials, winch, air compressor, Brembo brakes the size of elephant turds. The arachnoid LED lights are supposed to be the best performers in the business, and even an infotainment rig with Apple CarPlay worked its way into the build. Concealed within a lockable center console, of course. It’s every off-road wish list box ticked; then decorated to an exceptional level of beauty. Basically Ward’s idea of the ultimate work of art that could represent Toyota’s most recognizable 4x4 specifically built for display in Los Angeles’ Petersen Automotive Museum. We had a chance to drive it briefly, from which I can report it accelerates ambitiously and stops like a battleship anchor was dropped off the back when you stomp on the brakes. It’s also remarkably stable; since the chassis was purpose-built for performance, you don’t get the “compromised” feeling of an AMG G-Wagen. I was sure Ward’s FJ44 would be spectacular to look at before we even saw it. The only real shocker was how pleasantly quiet it was; the supercharger whine was more apparent than any angry spats from the exhaust. We also figured this truck would be relegated to mall-crawler status. How could you bring yourself to abuse a truck that had taken months to build, and was already destined to pose in a museum exhibit? Hit the gas and hang on, I guess! Which Ward didn’t have much problem with, it turns out, since he rolled the truck while he and his crew were out “testing” for a photo session. Luckily for him, when you employ a highly skilled team of engineers you can get things un-bent and back in action pretty quick. The FJ44 Petersen Special as we saw it yesterday looked as perfect as it does in these pictures.